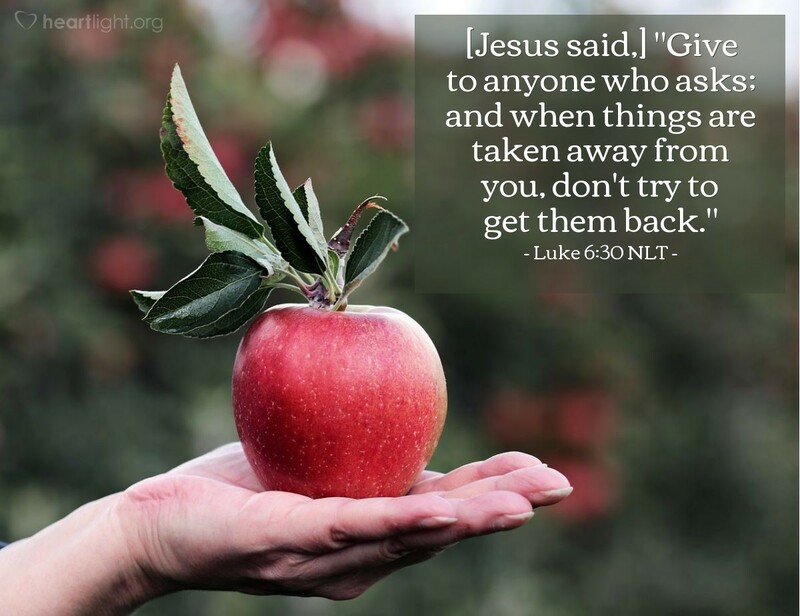 [Jesus said,] "Give to anyone who asks; and when things are taken away from you, don't try to get them back." Our stuff often owns us. We can even get more attached to our stuff than to the people in our lives. When our things are taken from us, we can be more concerned about the things than we are about the heart of the person who took those things. God wants us to be generous with others, just as he is generous with us. God poured out his grace so lavishly. Do some people abuse that grace? Absolutely! Is God sorry he offered us his grace? Absolutely not! Some people will abuse us financially or take advantage of us in a "deal." Rather than destroying the reputation of the church and bringing ruin on ourselves through bitterness, we need to forgive and let go of what anchors us to the world. O Father, give me open hands and an open heart to deal generously with those around me. Please help me from becoming bitter toward those who take advantage of me. Help me control my desire for "my justice," and help me seek after your grace, mercy, and generosity. In Jesus' name. Amen.